Treats to look forward to! At a time when every other email seems to be about detoxing we are concentrating on treating yourself or those you love! We have been busy getting some wonderful events organised for this year which are listed below and there are more in the pipe-line! After the last triumphant sell-out success of the Barber of Seville, we have huge pleasure in announcing the return of this exceptional company with the tragic story of Romeo and Juliet. This is a new experiment for us and for Popup since the production will be performed in the round, meaning that the audience will feel involved in the action. I have seen some clips from previous performances and it looks extraordinary - very intense and passionate as you can imagine and performed with Popup's usual musical assurance. I doubt whether there will be a dry eye in the barn by the end! We have kept the tickets at the same price as before but lowered the concession rate to £15 for under 25's (minimum age 12 recommended). Hopefully this will encourage more young people, especially if they have never been to an opera before and think it might be too stuffy and boring! 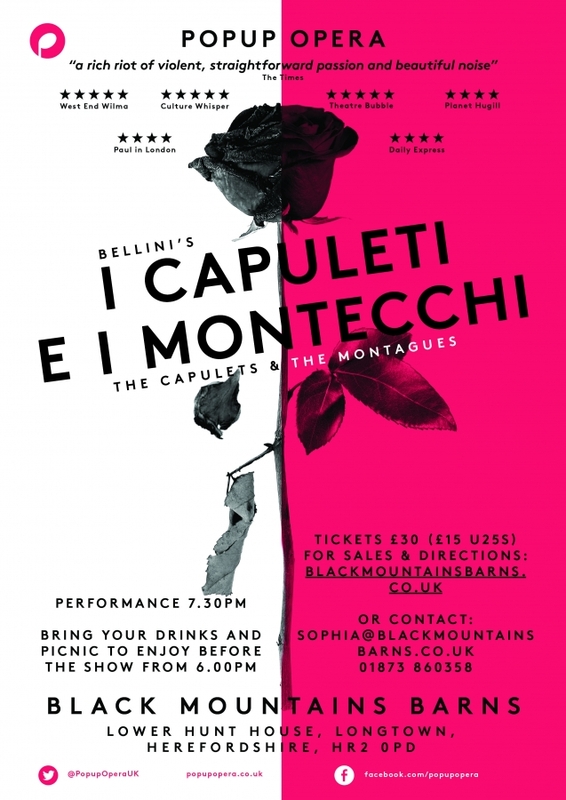 "This is Romeo and Juliet as you've never seen it before… an absolute must-see… we would like to go back and watch every night of the week"
This will be a day focusing on boosting the Immune system through the winter months. It will include a morning practice of yoga with quigong influences, of gentle movement and breathing aiming to help cleanse, strengthen and improve the flow of energy through the whole body. After a nourishing and delicious lunch there will be an afternoon of nurturing Restorative yoga and to finish the day a deeply relaxing Yoga Nidra practice following which there will be tea and homemade cake to finish th day. If you are dreaming of refreshing your body and soul with a short yoga retreat we are offering a lovely combination of Yoga and Foraging in early summer. This really will be an opportunity to get away for a few days, soaking in the beauty and peace of our beautiful surroundings at the best time of year. The weekend will comprise of six Yoga sessions to include Restorative yoga taught by myself and Lyn Olsen who is a wonderfully inspiring teacher with a particular interest in somatics. There will also be an afternoon of Foraging with our local renowned forager Liz Knight (a walking encyclopedia on the subject). Imbetween sessions there will be guided walks into the Black Mountains, or you can choose to relax with a massage or refelxology treatment or good book! Local accommodation is all within 5-10 minutes walking from the barns and of a very high standard despite being very reasonably priced, including our own delightful Wooden Wagons. More details will be on the website together with prices. Weekly yoga classes will continue as before with some new classes being added. Other visiting teachers will also be offering day workshops throughout the year which will be found on our webiste and facebook. Now that we have been going for a few years we are regularly receiving requests from musicians and artists for the chance to perform at the barns and are in discussion about a couple of things for later in the year! Meanwhile Robin and I wish you all a Happy New Year and very much hope to see you here at a some point! 'every race, every people has forever expressed love, life, joy and sorrow through the flute'. With the Beast of the East in retreat at last and hopefully a thaw on it's way, its a good time to plan ahead for warmer evenings of candlelight, music and wine! 'One World One Flute" is a programme of world music performed and devised by Nicola Woodward, a popular and experienced musician with an extensive CV that includes recitals at the Wigmore Hall, The Purcell Rooms, Highgrove, Buckingham Palace and our barns (with Opera Project)!! 'This programme is full of the music I love best – that influenced by music of the people. I would love to share this music and celebrate the differences and more often the similarities of folk music from around the world'. We are also delighted that Rachel Goode (soprano) from the Royal Welsh College, whose scholarship was part-funded by our Opera Gala last July, will join Nicola for the performance of Irish folk songs. Come and join us on May 12th 7.30pm for a magical candle-lit evening and enjoy a glass of wine from the pop-up bar. Saturday October 20th - Pop-up Opera's unique version of Bizet's 'Carmen' - no doubt an evening of tragedy and fun combined! We are excited by all these events and hope you will be too. Meanwhile we hope you are staying warm and having fun and we look forward to seeing you soon. Hopefully we will have thawed out by then!